D'Oyly Carte made four abridged sets during the electrical era, three of them in a two-month span in 1931 and one in 1933. Whereas the musically-complete 1928 Yeomen was issued on eleven double-sided discs, this abridged set took up only six. Obviously, a significant amount of material was omitted in the process, as suggested by the abbreviated cast list. The purpose of the abridged sets may well have been to compete with a similar series on the Columbia label, recorded between November, 1930, and June, 1931. Indeed, the first recording session for this recording came on the same day as the last session for Columbia's Yeomen and included two of the same artists, George Baker and Nellie Walker. Of all the abridged sets, this one was the least artistically satisfying. The complete set from 1928 featured the same Point and Fairfax. 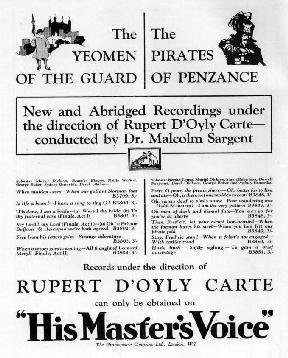 But, that recording had been made while the Company was on tour, and a number of non-D'Oyly Carte (and former D'Oyly Carte) singers were used. The chance to redo it with active Company members may have been a reason why this opera was selected. However, Granville, Dickson and Elburn do not improve on their 1928 counterparts. And, incomprehensively, the Dame Carruthers is Nellie Walker, a studio artist with no D'Oyly Carte background, rather than Bertha Lewis. For side 9, Francis reports the matrix number as 0B616-1. Chris Webster says that he has checked five sets, including an Australian issue, and they have all had the matrix number reported above. As HMV had pretty much ended the practice of issuing alternative takes by 1931, the strong likelihood is that Francis has the number wrong. For s. 10, Francis says that the recording date was 5 March. The matrix number, however, suggests that it was the last item recorded. It is notable that no side went beyond a second take, and no side needed a make-up recording session. 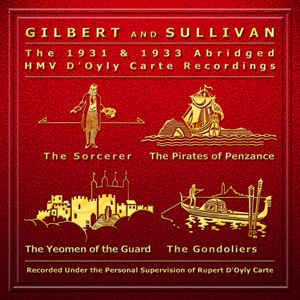 The abridged 1927 Trial by Jury and the 1933 Sorcerer are the only other HMV G&S sets of the period for which this occurred.